Helps remove years of teeth stains for a brilliantly whiter smile. 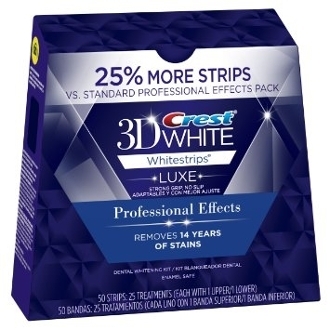 Crest® 3D White Luxe Whitestrips® Professional Effects are like an eraser for your teeth. Helps remove your teeth stains in just 30 minutes a day. Their no slip grip means the strips stay put until you take them off, allowing you to talk and even drink water while whitening your teeth. Helping you achieve professional-level teeth whitening results without the professional price tag. Important usage formation: Keep out of reach of young children. Not intended for use in children under the age of 12. Do not swallow plastic strip. Crest 3D White Whitestrips is not a substitute for regular dental care. Visit your dentist regularly. Avoid eye contact. Rinse eyes thoroughly with water if gel comes in contact with them. Handle strips with dry hands. Gel that comes into contact with the skin can cause temporary skin irritation and/or whitening. Wash hands with soap and water after applying the strips. Tooth sensitivity & gum discomfort: With all whitening products you may experience tooth sensitivity and/or gum discomfort. With products that provide a high level of whitening, such as advanced vivid and professional effects, there is a greater chance that you may experience tooth sensitivity and/or gum discomfort. With 1 hour express and intensive professional effects there is an even greater chance that you may experience tooth sensitivity and/or gum discomfort, as these products deliver a high level of whitening in less days. These effects are generally mild. These effects are temporary and not harmful. See insert for more information. If you are in need of dental work, have dental work, or have staining from medication, ask your dentist if whitening is appropriate. Crest 3D White Whitestrips with Advanced Seal technology are designed to hold well to teeth. Do not use on loose teeth, restorations, or braces. Crest 3D White Whitestrips will only whiten natural teeth. The strips will not whiten caps, crowns, veneers, fillings or dentures. Avoid contact of gel with cloth, leather or fabric..